Thailand’s military government has been forced to set a six-month grace period for new migrant labor laws with harsh penalties, after protests and panic among workers and employers. Migrant labor has a crucial place in the Thai economy, with up to 2.7 million workers from neighboring Myanmar, Laos, and Cambodia working in fisheries, construction, agriculture, and processing. But a June 23 government decree came with little prior public consultation with workers, trade unions or employers, leading to a rush by workers back to their home countries and crowded bus stations and border checkpoints. The decree, part of Thai efforts to control unregulated labor in the country, set out harsh penalties, including prison terms and penalties on undocumented workers of up to $2,700. A minimum wage for a migrant worker is about $200 a month. Employers were also targeted with fines of more than $23,000 for each illegal worker found on their premises. Sinapan Samydorai, convenor for Singapore based ASEAN Migrant Workers Task Force, said thousands of migrant workers had fled to their home countries. Thai labor rights groups say more than 100,000 migrant workers left Thailand since June 23. “The whole attention is not about preventing, but punishing the workers who are employed undocumented or those who don’t have [ID] cards and permits from the proper offices. That led to a scrambling of workers returning back to Cambodia, Myanmar – returning back in large numbers. And that was a panicking situation,” Samydorai told VOA. Thai Prime Minister, Prayut Chan-o-cha, on Tuesday announced a 180-day grace period though the use of a special executive decree to delay the introduction of the labor law. Panitan Wattanayagorn, an advisor to Deputy Prime Minister, Prawit Wongsuwan, said positive elements of the decree included protecting migrant worker and employers’ rights, but there were “very strict punishment for violations”. Panitan said implementation of the law was key and related government agencies were being called on to provide solutions during the six month transition period. “The implementation of it [the decree] has to be coordinated between different ministries, between the Labor Ministry, the Ministry of Foreign Affairs and Ministry of Interior and lastly in the interim period, there will be impacts on the implementation of the law,” he told VOA. The business sector has been hard hit by the decree as employees fled or were sacked by companies over fears of prosecution. In Cambodia, officials shut down more than 40 border crossings into Thailand, arguing it was to prevent Cambodians from entering Thailand and facing punishment. Thai farmers, who routinely pick up Cambodian day laborers on the border, were forced to leave empty handed after the gates were closed. On the Thai-Myanmar border two police checkpoints were closed amid allegations Thai police were extorting bribes from migrant workers. 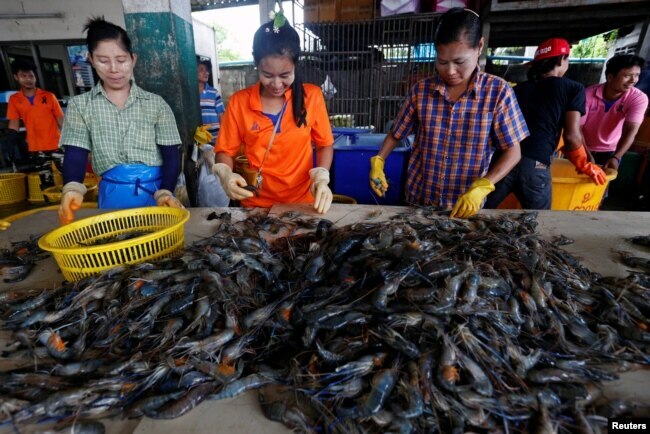 Myanmar migrant workers sort shrimp at a wholesale market for shrimp and other seafood in Mahachai, in Samut Sakhon province, Thailand, July 4, 2017. Boonthai Chailert, president of the Chiang Mai Tourism Business Association, said the laws created problems for small businesses, including tourism in the Northern provinces. His main concern is the workers will not return. “They go out; they go back to Myanmar, or to Cambodia or to Laos. They don’t come back again because in Myanmar and Cambodia or Laos their country is developing. They have the [experience] in Thailand. They go back, and I think the policy of the Thai government is a very, very [big] mistake,” said Boonthai. But major Thai industrial employers of migrant workers said they supported the legislation with employees already covered and registered. Thailand has been working with the U.N. International Labor Organization to create formal registrations for migrant workers, with labor agreements with Cambodia, Myanmar and Laos. But Nilim Baruah, a senior ILO research specialist, said while parts of the law were welcomed, a drawback was a lack of consultation. “The problem is that there was no consultation in the final draft law or with the employers, with trade unions, with NGOs [civil society] or even with the ILO. It would have been much better to have a consultation, a public hearing that they are planning to do now,” said Baruah. He called for a review of the high penalty rates and prison terms and an easing of restrictions on migrant labor mobility. The Thai labor reforms covering migrant workers come as Thailand was recently informed it remained in tier 2 on the U.S Trafficking in Persons watch list. Labor Minister, Sirichai Distakul, said the new law’s penalties were in accordance with laws linked to human trafficking and child labor.